At CEDIA Expo, Lutron goes all in on lighting fixtures and bulbs with integrated Ketra room. Ed Blair takes reins as executive vice president for custom market. 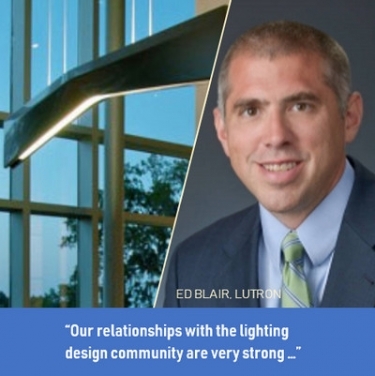 Lutron executive vice president Ed Blair says lighting fixtures is the best growth opportunity for dealers, and adding fixtures and bulbs to a showroom is important. Twenty years ago, not many A/V integration companies would have thought lighting control would be a major part of their business. Likewise, 10 years ago few custom installation companies were focused on bringing motorized shade control to their clients. Today both of those product categories represent a significant stream of revenue for dealers. Lutron Electronics was arguably the major force behind bringing both lighting control and shade control to the integration market. Today, Lutron is ready to guide dealers to another potentially strong product category: lighting fixtures and “light sources,” which is a fancy way of saying light bulbs these days. “Integrators are uniquely positioned to understand the technical aspects of making the systems work well and have the relationships in the luxury and high-end residential community ..."
Blair has been with Lutron since 1996 in various roles, including in the company’s Window Systems Business unit since 2007. More recently, he headed up the company’s acquisition of Ketra, a manufacturer best known for its tunable white lighting solutions. As executive vice president, Blair now leads Lutron’s high-end residential business, including window systems, light fixtures and Ketra. Blair refers to Lutron’s engagement in the market via its Ivalo and Finiré line of products for integrators and sees Ketra as an extension of that focus. “Integrators are uniquely positioned to understand the technical aspects of making the systems work well and have the relationships in the luxury and high-end residential community to get to the key stakeholders during the design process,” he adds. So how does Lutron plan to get dealers involved in the fixture business? “Our relationships with the lighting design community are very strong and we have an ability to help the integrators develop new relationships and get pulled into projects. Other building and design professionals are eager for someone to help them reduce the complexity on these jobs. Integrators are really the most qualified to do that,” he says. Lutron aims to engage integrators with the American Lighting Association, American Society of Interior Designers and the American Institute of Architects, among others. The Coopersburg, Pa.-based manufacturer also plans to connect dealers with lighting designers in local markets to either have lighting designs done on behalf of CE pros or in partnership. “We anticipate some of the leading-edge integrators are going to see this business opportunity and they’re going to want to make the investment to bring some of that capability into their organization, the same way they hired fabric and shade specialists 10 years ago,” adds Blair. Another investment Blair believes integrators will want to make in the category is adding fixtures to their showroom facilities to help them market the new category to clients. “In the absence of being able to demonstrate lighting, it’s potentially difficult to show the value to the client of what they’re actually purchasing. Lutron’s Experience Centers will all be equipped and our integrators are always welcome to use them, but I do think those integrators who are going to see this as a growth category are going to want to plan for making those types of investments,” he states. Will Integrators Really Want to Sell Light Bulbs? One of the growing niche trends in the lighting fixture business is wellness lighting, and Blair believes that could be an initial driving force of interest among integrators’ high-end clientele. “We think the integrators’ focus, especially in the early days of growing this category, needs to be on placing light sources into high-end and luxury homes that allows them to produce the perfect light at the perfect time of day for the application. That can have multiple dimensions,” he notes. Ketra light sources have the ability to change color temperature, which mimics the cycle of the sun and affect a person’s circadian rhythm. A bulb can start “warm” at sunrise, and finish “warm” at sunset, with a cool blue light in the middle of the day, for example. The bulbs can also accelerate the light for a different time of day, so when a homeowner is getting dressed, he or she can advance the light source from 3 p.m. to 8 p.m., for example, to see how the evening light will affect their attire. Another application of Ketra technology is its ability to produce white light without a white LED, but by just using the RGB (red, green, blue) LEDs. By doing this, the bulbs can change the saturation level of the light. Ketra light sources have a mode called “vibrancy” to create the ideal viewing situation for artwork, paintings, sculpture or other important items in the home. That could be the selling point. At CEDIA Expo 2018, Lutron will demonstrate Ketra in an integrated solution with Lutron products. “We actually have developed a luxury room experience to be able to bring the magic of the Lutron with Palladiom shades and keypads together with the magic of the Ketra light source, and do it in a way where the dealers get an immersion and they can live through the benefits throughout a day and throughout a luxury home experience,” says Blair. Integrators will be able to take guided tours of the room every 15 minutes during the show. If Lutron wants to help integrators, they should offer Ketra color-tunable bulbs that work with the Clear Connect protocol and Radio RA2 controllers. That would expand the most popular product line to include the light source, and would work for both new construction and retrofit jobs. I do find it odd that Lutron hasn’t innovated on the LV/DC side (at least nothing public), but I think we’ll see that happen through Ketra. Anyway, great questions to ask them at CEDIA. Sorry, I should have been more clear in my original post. I agree that lighting is the next big opportunity for integrators. What I’m questioning is Lutron’s approach, and if it’s really a good fit for integrators. The design work is done by local lighting design firms and the installation is done by licensed electricians. I don’t see this being a clear win for integrators. Other companies, such as LumaSteamn and others, are offering lighting design consultation services directly to integrators and offer low-voltage lighting product lines that can be sold and installed by the integrators. It seems to me that there is a gap in Lutron’s product line and that high-voltage fixtures don’t create as much of a right-to-play for integrators. I’ve always viewed Lutron as a leader in this space, but it seems like there’s a gap yet to be filled for this to be a transformative opportunity, like the way controls and shades have been in the past. But maybe I’m missing something and the Lutron offering really is a perfect match? I think you’re missing something, Carlton. Integrators were saying that about window coverings a decade ago. I agree it does sound strange today, but I think it will happen. You sell furniture, right? Same thing, I believe. I feel like I must be missing something, because it doesn’t seem like integrators will have any part of the sale or installation of the fixtures. Other companies are targeting integrators via low-voltage tunable white fixtures. That seems to be a gap in the Lutron product lines. Is this the case or am I missing something?